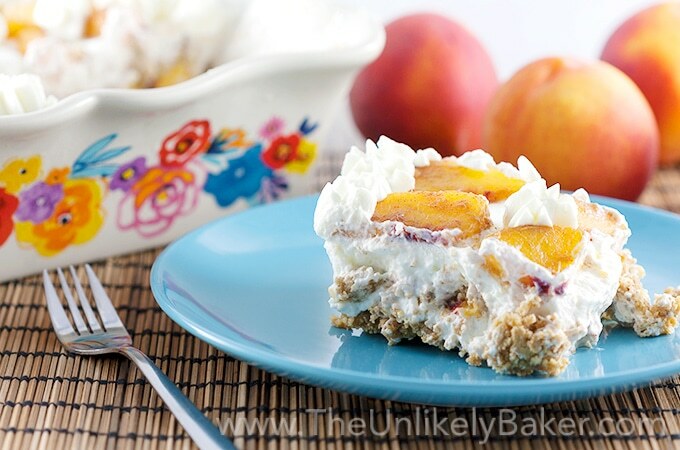 This peach icebox cake is a peaches and cream dream. Buttery graham crackers, cool whipped cream, and sweet cinnamon peaches make this a fabulous, no bake treat. Welcome to week 3 of our No-Bake August (can you believe it’s mid-August already? I think I’m going to cry). We went on a peach rampage this summer. We were so afraid they’re suddenly going to disappear that we keep buying them and forgetting that we still had some at home. So what to do when you’re overrun? Peach icebox cake. I shared my mom’s recipe for a traditional Filipino refrigerator cake a while back. That was made with strawberries but can easily be subbed with whatever was in season, like peaches. Though I love my mom’s recipe, I do like a more substantial graham cracker crust so for this peach icebox cake, I made the crust thicker. And I’ve been on a peaches + cinnamon kick lately so I added that too. For a more traditional, straightforward route check that recipe. For a slightly different version of peaches and cream, this is the recipe for you. Peaches and cream is a match made in kitchen heaven. They just go so well together. Add graham crackers to the mix and you have an icebox cake that’s so easy to put together and so good. It looks nice too so it’s always a great dessert to serve when you have company. Quick, easy, delicious, no-bake. What else can you ask for? Enjoy! Hope you’re having a fantastic summer. This peach icebox cake is a dream. Buttery graham crackers, cool whipped cream, and sweet cinnamon peaches make this a fabulous, no bake treat. Combine 2 cups graham cracker crumbs with 1/2 cup melted butter until the crumbs are evenly moist. Spread and press evenly onto the bottom of your freezer-safe dish (I used a 2L baking dish) and freeze while preparing the rest of your ingredients. With the mixer on medium-high speed, beat 2 cups heavy cream to medium peaks. Switch to low speed and drizzle your condensed milk. Start with 1/4 cup and taste - add more if needed. Just before assembling your cake, toss your peaches with 1/4 teaspoon cinnamon and set aside. Bring out your dish from the freezer and start assembling: spread cream on top of your graham crust, top with peaches, then top with graham cracker cookies. Repeat for another layer. Chill overnight or until set. To make whipping your cream easier and quicker, chill the bowl and whisk you're going to use at least 15 minutes before you plan to use them. Did you make peach icebox cake? Tell me about it in the comments section below. I’d love to hear all about it. What’s your favourite icebox cake? This looks so good! My grandmother used to make something very similar! Aren’t those the best? 🙂 This is based on my mom’s recipe and it just brings back so many happy memories. Thanks Mindi! This looks amazing and so yummy. I wish I could have some right now! 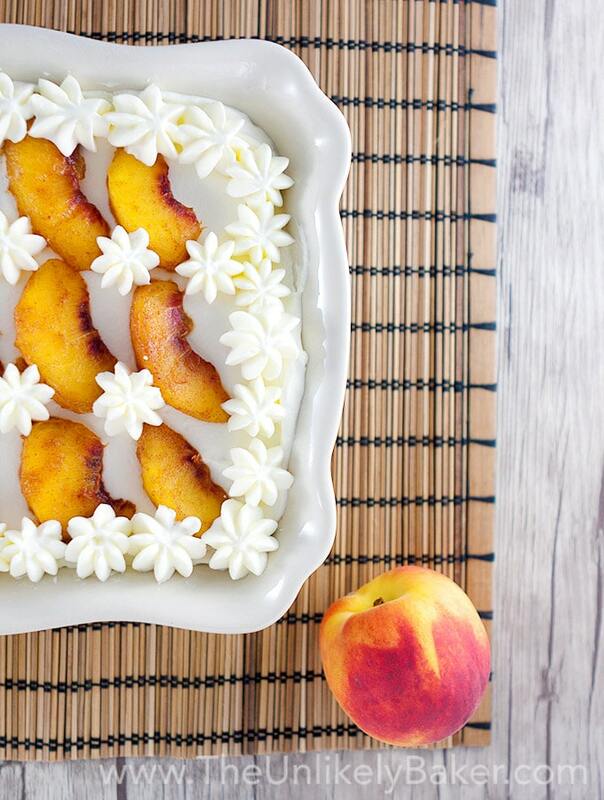 I am not really a huge fan of peaches but this dish is worth trying!! The great news is, you don’t need to bake this peach cake! 🙂 Thanks Janella! WOW. This looks amazing. I love the cute little presentation design you made, too 🙂 It’s even better when the food LOOKS great! Pretty food is always better haha 🙂 Thanks Kathryn! Perfect idea for all of these Palisade peaches that I want to use! Looks great! Thanks Kim! Let’s enjoy all these gorgeous peaches while we can! This dessert looks so refreshing and cute! Would love to make this the next time I have some friends over. Sounds like a plan! Thanks Crystal! Would love to hear how it goes. Love it!!! Peaches and cream is like perfect combination. I love how it comes together in an old school ice box cake. Just reading the ingredients sounds yummy. A good summertime dessert. I have about a million peaches outside that are going to be ripe soon! Pinning this for later 🙂 I’m sure mine won’t look as pretty as yours, but hopefully it tastes yummy!! Aw I’m jealous of your one million peaches! 🙂 Thanks for the pin Desteny! This looks wonderful. I was thinking of making a bourbon cocktail with peaches next week … I may need to pick up a few extra and give this a shot, too! I want some of that bourbon peach cocktail! 🙂 Thanks Sara! This looks so delicious and fresh! And no oven needed so it would be easy to make. Perfect dessert for a hot summer day. 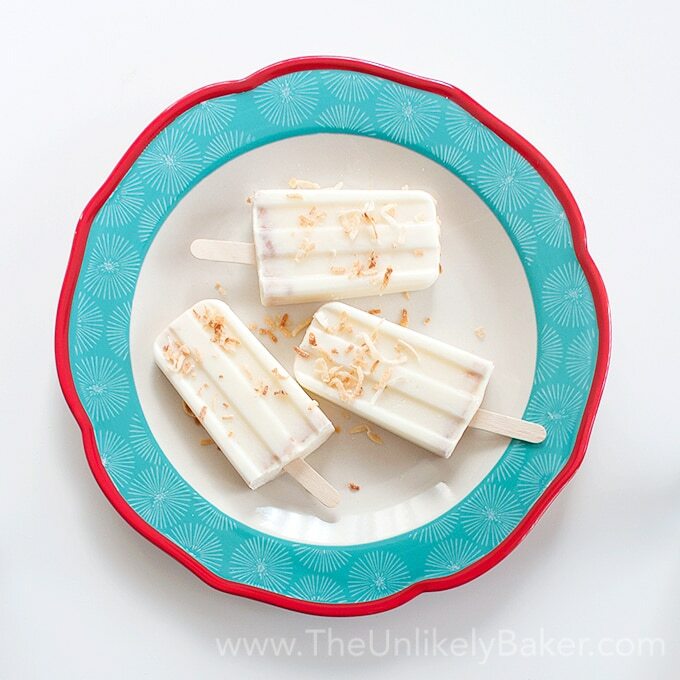 This is the ultimate summertime dessert! Sweet and creamy and just peachy for BBQs…. or for a treat yo’self day. I’m lovin’ this! It is isn’t it? Just need to eat it fast outdoors before it melts! (Though that’s not too bad too!) Thanks Karly! This cake looks absolutely delicious! And the pretty details on top!!! Amazing! Dreamy, creamy and delicious is a perfect way to describe them! I love peaches, I am on diet right now so cream isn’t allowed but I love eating peaches and pineapple. So juicy! Thank you for your recipe, I have to save it for when I get off the diet. 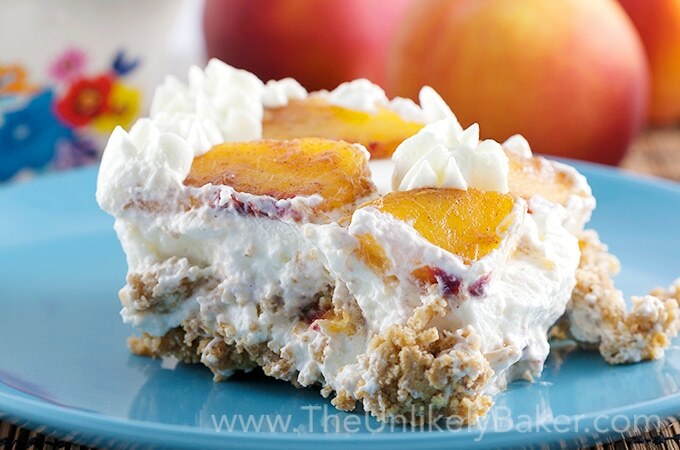 I love that this peach cake is no bake which is brilliant because it makes your job so much easier! Love the photos . Ah yes, no-bake desserts are made for summer! Thanks Ana! This looks so yummy! I’d want to make the whipped cream from scratch though. Just something so amazing about it! Homemade whipped cream is the best 🙂 Way better than store-bought. Thanks Mary! Oh goodness gracious does this look so good! And sweet! Hi Ivelisse! Thank you! Hope you get to make it soon! I LOVE this idea – and that it’s no bake. I want to in my mouth right now! Great photos and thanks for sharing this – must.make.soon. LOL thanks Vanessa! Would love to hear how your no-baking goes! 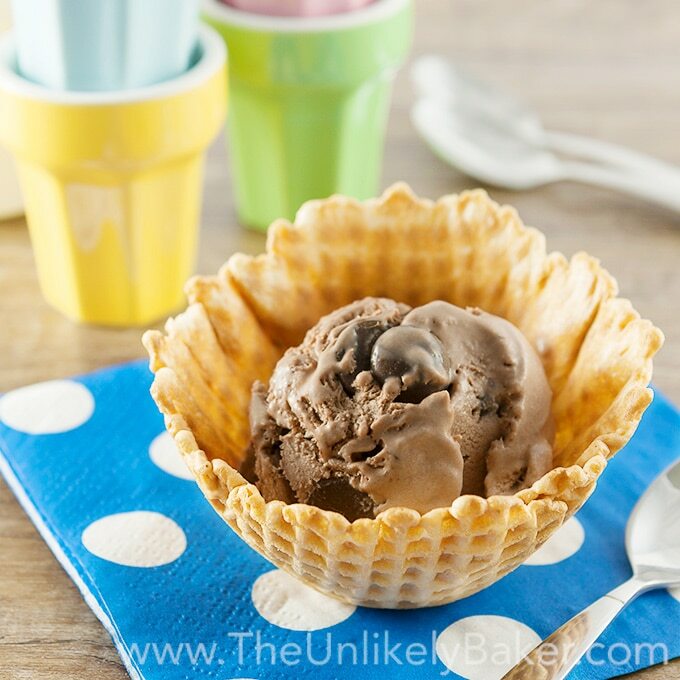 What a delightful and perfect summer time treat! What got me even more excited is the fact that there is no sugar added. Yummy! AHHH…it sounds and looks SOO good!! 🙂 I was just thinking about getting some tiramisu. 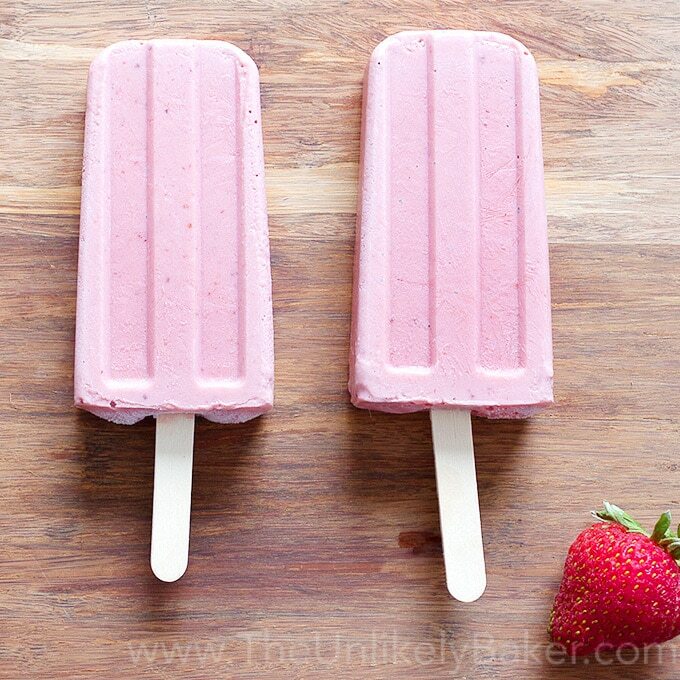 I feel like something super creamy 😀 this would be lovely too.. Thanks! 🙂 Ok now you have me craving tiramisu…recipe exchange lol. Thanks for saving. Hope you get to make this soon. Would love to hear how it goes. My father would adore this cake! He loves anything involving peaches. I love even the simple icing work you put to this icebox cake – so simple yet so sophisticated-looking! Aw thanks Lisa! Hope you get to make this for your dad and hope you both like it! Hi Cecilia! Us too though sometimes we buy too much haha. Ah well, that’s never a bad thing I guess 🙂 I use Zip Recipes. I like it, no problems so far. I remember trying Yummly once too and had to deactivate it. Was too buggy or maybe it wasn’t just compatible with the other plug ins I’m using. I almost never make these so don’t really have a favorte to make. That sounds really tasty, I wish I could try a piece of it now. My oh my! This is oozing with goodness! LOL thanks Robin! Hope you get to give it a go! I love fresh peaches too, it’s really delightful and you really can’t help but make the most of it this summer. This is pretty cool. It’s easy to make and you don’t have to fire up the oven! Yes. Tis the season when it’s too hot for a hot kitchen! 🙂 Thanks Elizabeth! This sounds so great! I love peaches so much! Aren’t they just awesome? Really one of the best things about summer 🙂 Thanks Neely! Hope you get to try the recipe! Oh this is an awesome peach recipe. It looks amazing with those cream blossoms! Thanks Liz! TBH I eat the excess cream like ice cream lol!! The peaches look wonderful. Your creation is so fun and I want to dive right in. Hi Peter! Thanks a lot 🙂 Hope you get to try the recipe while all these gorgeous peaches are around! 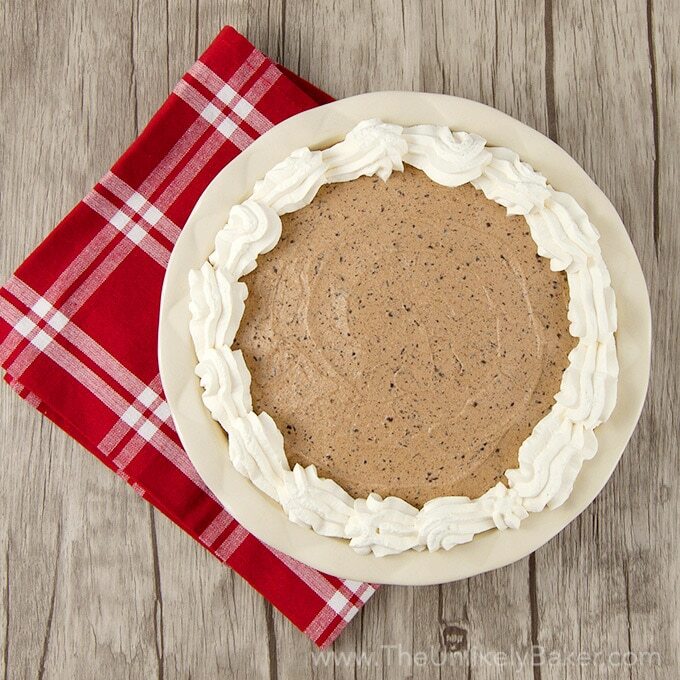 It is definitely the time of year for no bake desserts! And for peaches. We have so many yummy peaches here and this cake would be perfect for them. Peaches and cinnamon are a match made in heaven. This looks delicious! They absolutely are 🙂 Add cream and I really go nuts lol. Thanks Amanda! Wow, this is soooooo pretty! Oh, this looks wonderful! Especially as peaches are in such abundance now. Definitely trying! Thanks a lot Susan! Peaches are just so wonderful this time of the year aren’t they? 🙂 Hope you like this! Would love to hear how it goes. Love refrigerator cake! This variation looks amazing. So refreshing and perfect for summer. Love the piping on top. Hi Tara! Thanks! I always have to think REALLY hard about cake decorating.It does not come naturally to me at all lol. Can you believe that I have never made icebox cake? This needs to change and I think I’ll start with this delicious looking recipe! Love the look of this! I made an icebox cake the other week and it’s so easy. I am so not a baker so this is right up my alley. Thanks Natasha! Aren’t they great? So quick and easy and delicious! Really perfect for summer. What kind did you make? That sounds to die for–at least for me. I love every one of those ingredients and no-bake makes it even better. Will I attempt to make it–not sure–I’d probably eat it all by myself and pretty quickly which would be disastrous for both my blood sugar and my weight! Hi Michele! I must admit, since I started this blog I’ve had to exercise twice as hard haha! This icebox cake OK I think. I mean, it has FRUIT which healthy lol 🙂 Hope you like it! Hi Dawn! Icebox cakes are my mom’s specialty I guess. Too hot to keep the oven on all the time I suppose. She would make all sorts though never with fresh peaches (just canned!) because we don’t get them back home. Thanks for your sweet comments as always. Happy Saturday!